The Bulgarian Rose oil is one of the main ingredients in many famous French perfumes. About 2.3 million aroma bottles annually, contain drops from the “golden liquid”. One of the biggest Bulgarian producers has delivered rose oil for some of the most world-famous companies in the last 5 years, and up to now, the Bulgarian Rose Oil was used in more than 11 million perfumes. has become one of the well known Bulgarian symbols all around the world. This national treasure is being celebrated throughout the Rose Valley with the annual Rose Festival. The celebrations are held at the end of May every year with a parade, rose picking rituals, traditional dances and lots of fun. Hundreds of tourists arrive each year from Japan. The feast is extremely popular and respected in the Land of the Rising Sun. 2nd of June was pronounced for a Rose Day there in 2014. The holiday name is to be pronounced “ro dzy” which extremely resembles the name of this flower in Bulgarian. 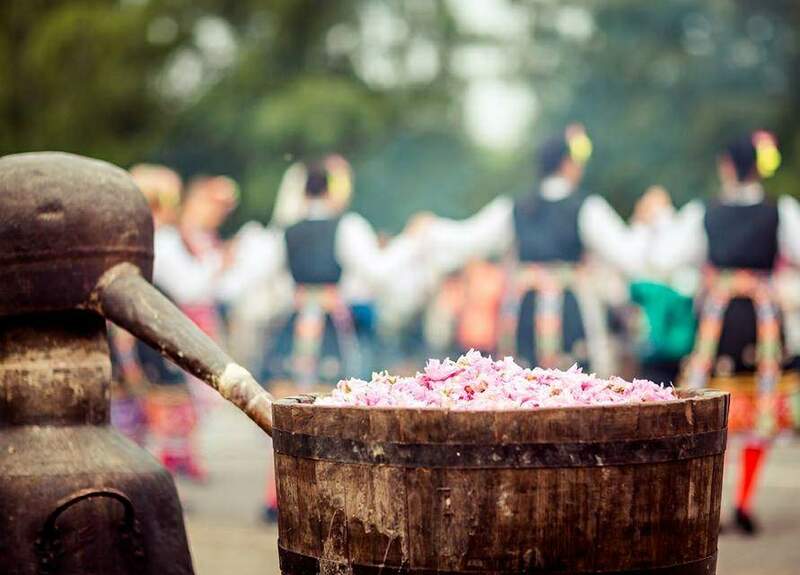 One of the most impressive events during the festival is the Rose picking and rose brewing ritual, that attracts hundreds of official guests and foreign tourists. Rose pickers are dressed in traditional costumes; authentic folklore ensembles and mummers resound the rose gardens and greet the guests. In the same time the rose oil is boiling in “gyulpana” (rose-distillery tank) and that freshly produced rosewater is given as a gift to the guests.